may Jacob’s God lift you safely above it. Let us consider [how we] might stimulate one another to love and good works, not giving up meeting together (as some have been doing), but encouraging [one another] even the more so since you see the day drawing near. May you, O reader, stimulate those around you to love and good works, by grace. And may those around you do the same for you. …just as the LORD had commanded Moses. The Tabernacle complete, Gods Presence fills the space. God and the people will meet there. Thus the Book of Exodus ends. At the same time, the Book of Exodus means something for us because in some ways we stand in a similar predicament. The people of Exodus had received the gift of deliverance and had been brought into a new relationship with God. They waited for the fulfillment of the promise made to Abraham–the promise of land, descendants, and blessing. We of the church look back to the Cross and Resurrection, and we have been brought into a unique relationship with our Father. We rejoice in our salvation and in the new covenant which God has established with us in Christ. Yet we wait for the consumation of the kingdom–to a time when Christ will come again to make all things new. We stand as participants in the last act of God’s triumphant drama, but the final curtain has yet to fall. It sounds like an Advent message, does it not? The Kingdom of God was evident among those whom Jesus healed, the marginalized people whose dignity he affirmed, and the women who financed his ministry. Yet that was nearly 2000 years ago. We wait for the final curtain to fall. As we wait may we do as the LORD commands us. So may our fate be different from that of the liberated generation of Israelites. May we live in gratitude to God, who has freed us from our sins. Tagged with Easter, Exodus 38, Exodus 39, Foster R. McCurley Jr.
And it was: in the first month, in the second year, on the first day of the month, the Tabernacle was set up. 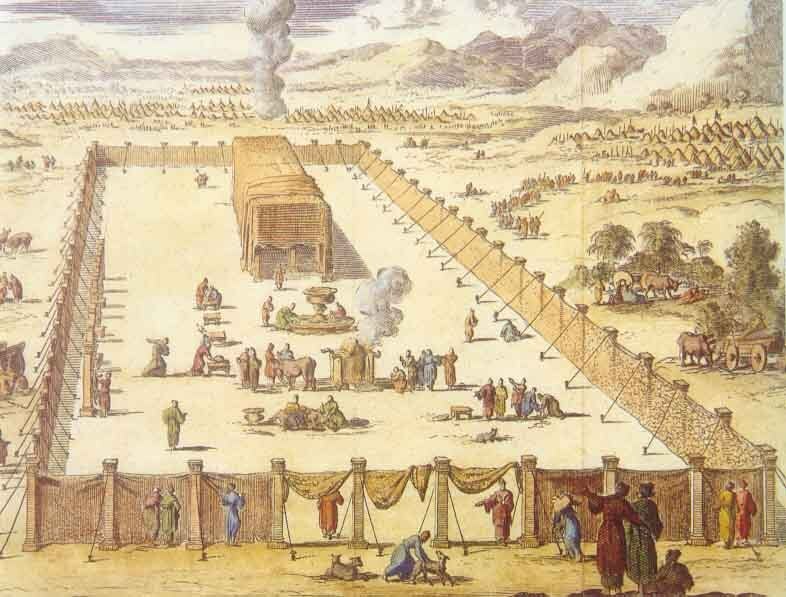 And Moses set up the Tabernacle and put on its bases and set its frames and put on its bars and set up its columns. 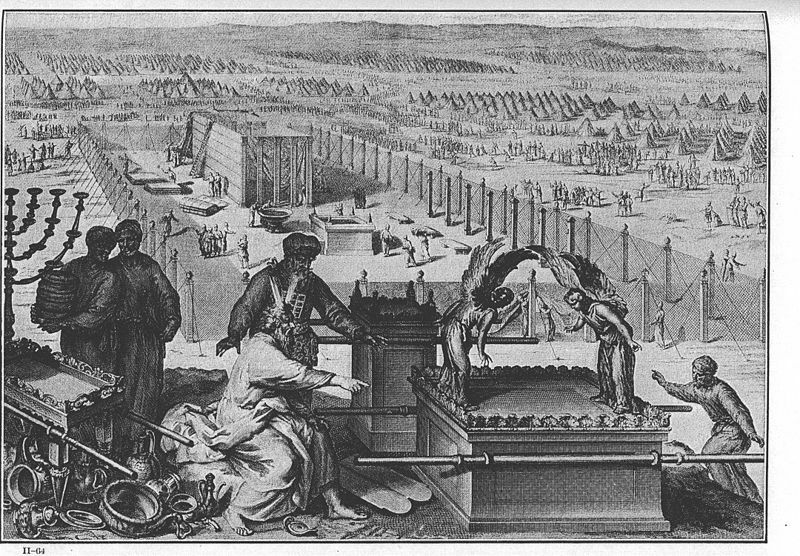 And he spread the Tent over the Tabernacle and set the Tent’s covering on it above, as YHWH had commanded Moses. And he took the Testimony and put it into ark, and he set the poles on the ark, and he put the atonement dais on the ark above. And he brought the ark into the Tabernacle and set the covering pavilion and covered over the Ark of the Testimony, as YHWH had commanded Moses. And the cloud covered the Tent of Meeting, and YHWH’s glory filled the Tabernacle. And Moses was not able to come into the Tent of Meeting, because the cloud had settled on it and YHWH’s glory filled the Tabernacle. And when the cloud was lifted from on the Tabernacle, the children of Israel would travel–in all their travels–and if the cloud would not be lifted, then they would not travel until the day that it would be lifted. Because YHWH’s cloud was on the Tabernacle by day, and fire would be in it at night, before the eyes of all the house of Israel in all their travels. Or the kingdom of Heaven is like a big net thrown into the sea collecting all kinds of fish. When it is full, the fishermen haul it ashore and sit down and pick out the good ones for the barrels, but they throw away the bad. This is how it will be at the end of this world. The angels will go out and pick out the wicked from among the good and throw them into the blazing furnace, where there will be tears and bitter regret. Have you grasped all this? You can see, then, how everyone who knows the Law and becomes a disciple of the kingdom of Heaven is like a householder who can produce from his store both the new and the old. When Jesus had finished these parables he left the place, and came into his own country. The Book of Exodus with an emphasis on Moses. Yet, at the end, Moses does not speak. God once spoke to Moses in the leader’s own tent. But, in Chapter 40, there is a new Tabernacle. The emphasis is moving away from Moses to God. The people are not to move until the cloud of YHWH moves; they are to follow God in more way than one. If you are reading these words, O reader, you probably agree that you ought to follow God. But what does that mean? Jesus, in Matthew, provides a partial answer. The parable of the fish in the net points toward an inclusive church, one that does not take upon itself the task of labeling some fish “bad” then throwing them back. This is a repeated theme with Jesus. For another example, consider the Parable of the Mustard Seed. The mustard plant, a weed really, provides shelter to a wide variety of creatures. Think, too, about the tares and the wheat. The weeds and the wheat must grow up together until harvest time, and God will oversee the separation. To do otherwise would damage valuable wheat. Chapter 13 contains these parables, too. The grouping is not accidental. And, Jesus continues, coming to him does not mean beginning at square one, or forgetting all that one used to be. Transformation follows, but one brings oneself–complete with one’s knowledge, skills, and abilities–to the spiritual journey. The old has its proper uses, just for different purposes. I know something about transformation. I have never had a dramatic conversion experience of the “born again” variety, as many North American Evangelicals understand it. Nor do I seek one, for it is not necessary. I have a long-standing relationship with God which has grown during a long process, not from an event. My life as I knew it collapsed in late 2006 and early 2007, resulting in a traumatic crisis, a death of sorts, and a resurrection in an altered form. My former self ceased to exist, and a new self with the same outward appearances came into the world. I became a better person by grace alone, and those who perceived this the most were those who knew me the best. I am a new person, but all the knowledge, skills, and core personality type of the former self carry over. Yet there are key differences. I am more patient and kind than before. Leniency comes more easily to me, and I am far less likely to despise unpopular and accused people. As a recipient of grace, which is inherently extravagant, I am more likely to extend it to others. I have not “arrived” spiritually, but I am closer to my destination. God is responsible for this. I draw upon the best of the former self, as well as the unpleasantness which constituted my death-resurrection crisis, to inform the new man. And I hope that I follow God more often than not. May you, O reader, do the same.